Find below a simple procedure of knowing where you have been placed to before admission letters are sent. The Kenya Universities and Colleges Central Placement Service (KUCCPS) has completed the process of placing candidates who had applied for different courses after the first and second revision were done. The 2018 Candidates are expected to be admitted to different higher institution of learning for the 2019/2020 September Intake. NOTE: This procedure is only applicable for students who have been admitted for government sponsored programmes (formerly known as JAB students). NOTE 1: You will also receive an sms of the university you have been placed by latest 16th April 2019. NOTE 2: Details of the course and university you have been placed after second revision will be available on the kuccps portal latest 16th April 2019. NOTE 3: From May 1, 2019, kuccps student portal will be open for students who wish to transfer their placement. Your admission letter will be sent either July or August. However, most institutions like Moi University, University of Nairobi, Kenyatta University, Maseno University do not send admission letters via posta. You will just have to download them online. The above procedure is only applicable after second revision of courses is complete. You will not be able to see the message of the university or college you have been placed to until second revision is done. The only way to know whether you first revision of courses application was successful is to use the the procedure provided in this page: KUCCPS 2019 placement (link removed since first revision and second revision is over, use procedure above to check your placement). We will update here when the time of downloading admission letters comes and how to go about it. To avoid missing any of our updates subscribe below. I know I have been placed, how can I again see which institution and what course I have been offered? have 2018 candicates been placed? As at 24th January 2019, they have not been placed. Kindly download the attached pdf and check whether you are in the list of the unplaced students. If your index number is not there and you did first revision then it means your application was successful. Placement will be done later after second revision is completed. I applied but i haven’t seen message/reply in my account after logging in…..what should I do????? Kindly download the attached pdf and check whether you are in the list of the unplaced students. If your index number is not there and you did first revision then it means your application was successful. University placement will be done later after second revision is completed. Just do second revision if you were not lucky in first revision. You might want to change your course later after being placed. Can i be told the course i have been placed for kuccps …. You will know after second revision of courses is complete. For now the most important thing is to confirm whether you have been placed. So you mean atakama nimefanya second revision of which imebidi nichange course na nkaeka ile sipendi ivo saana….i mean haikua choice yangu bado naeza change nikishakua placed???? How will I know whether am among the government sponsord students? Procedure has been provided above. When will i get a notification of the course chosen by KUCCPS to me after doing my second revision? We will update the date after second revision is over. Be sure to subscribe to our updates. 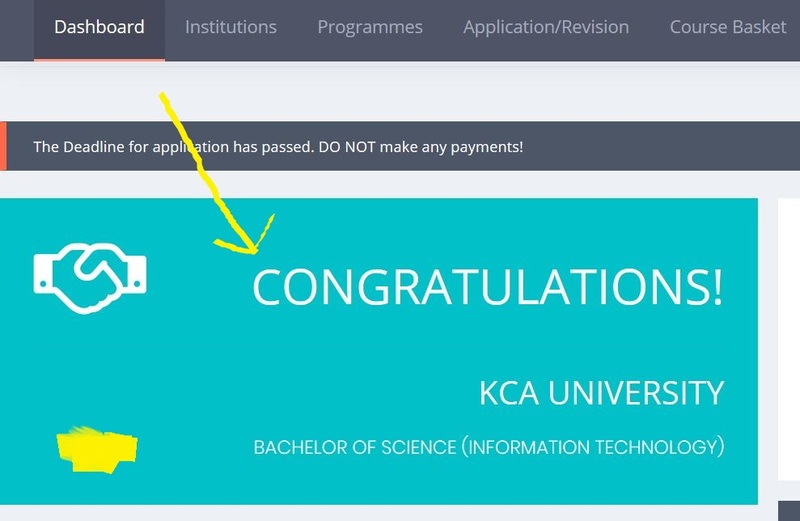 If you are not in the list of unplaced students and are seeing this message in your kuccps portal account: “You have provisionally secured one of your choices subject to approval by the Placement Service Board” It means your information was successfully submitted during first revision and is being processed. KUCCPS will provide University and Course you have been placed after the completion of processing of second revision applications. again after the second revision is over how long do we wait for the approval of universities and colleges and the courses that we applied??? hello am samuelwafula i got a B~ math B+ Kis C+ Eng C Bio C+ Chem B i applied education science during 1st revision but i was not placed kindly help what can be the cause? have those who have already been placed joining school this may??? Every University sets its own admission date and Month. I wanted a certain course in a university where their min entry was only a c+ general.but whn I came to kuccps I found that the requirement are different.what might be the reason…? can someone change the university or college applied after a successful placement?? Now that the second revision is over, how will I know the course and university I’ve been admitted to? You have to be patient until processing of second revision is over. Your university of admission will be posted after then. I’m eager to know where I have been placed kindly how can I know?? Be patient for a month or so until the second revision is over. what next when I was unplaced by kuccps and I did not apply/revice my cources for the second time? 1)When you have seen the box how do you know the specific place and course you’ve been placed?? 2)Is it true that securing a chance in the first choice is rare?? I would like to know if my application for university is through because i applied but i haven’t received any message, please assist me. Now that the second revision has already ended, and we have got the message that we are placed, what next now is how or when to know where we have been placed and for which specific course so I humbly request for you to clarify that please. You know we are anxious to know because most of us that is the future we will depend on. Please help me I am not seeing anything in my box what do I do? I already succeeded on my first application but upto now I didn’t find the institute and the course choosen to do. how shall i know course and university placed. I applied and my application was succesfl and i have not recieved any information whether am placed or not. So what can i do to get the information? now the placement is complete,how can i confirm the course and university i was placed? Can I be able to change the course in university for example may be am supposed to undertake computer science and am not ready for that course can I I be allowed to do another course?? I applied first revision but I was not qualified and then applied for second revision ,when will I be able to find out my admission? Hi, I applied kuccps for the first time and I didn’t get a notification if I had secured a place at the Technical Training. I downloaded the attached PDF of the students who were unplaced yet my index wasn’t there. Does this mean my application is in the process? The website is down but will be up. Check back later. I applied for the second revision and how will I know the institution and the courses of my choice that I selected because I haven’t received any message please help me know..
actually am really eager to know which university ive been placed……it kinda takes long ….wen n how are we gonna get the information……….is it may? or june?or july? or maybe august? may i know the university that i have been placed, please? I did first revision but I have not seen any placement update,what can I do to know? You will have to wait for second revision placement update to check whether you have been placed. I have not seen whether I have been placed…..my index number is not in the second revision…..what should I do and when I applied it was successful? hello i’m Isaac kiplagat i applied for my first revision but i haven’t receive my confirmation message since and i’ve also checked on the unplace students and i found out that my admission number was missing there what should i do now? Uhm….hi i have a concern…… i wasn’t in the list of those who had to do second revision yet i still cant see the message that was posted earlier..what could be the problem? That message was later removed from the portal. hello, how can i know the institution which i have been placed now that the second revision is over? I choose the courses wrongly.what should i do? You can change them after placement subject to requirements and deadlines. Wait after second revision! When is second revision completing? I HAVE NOT RECEIVED ANY MESSAGE CONFIRMING THAT I HAVE SECURED A CHANCE IN THE UNIVERSITY AFTER THE SECOND REVISION COULD THERE BE SOMETHING WRONG? Check portal using instructions provided above. Messages do delay. please make me understand why i have secured to be placed in kenyatta university to study health records yet i was told earlier that the course is not offered? what should i do ? please i need the assurance that the course is currently being offered in kenyatta university. How can I change my degree course in the some university I have been placed…help please? I jst applied for the first revision and yet hv not received any message, what can i do? Have you checked kuccps portal? Most students knows universities where they will attend but me I’m still stranded. Pliz help . You have stated that we will receive a text message by latest 16th April, but I haven’t received any message, should I continue waiting….? Check your portal, if you see the placement message in the portal why should you wait for sms.